DT Member Lisa shares one of her gorgeous Thinking of You greeting cards to inspire you to make one for a friend. 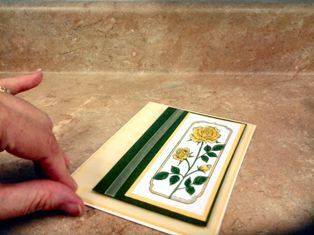 Making greeting cards is a wonderful hobby to get started on and we're sure you'll have so much fun! 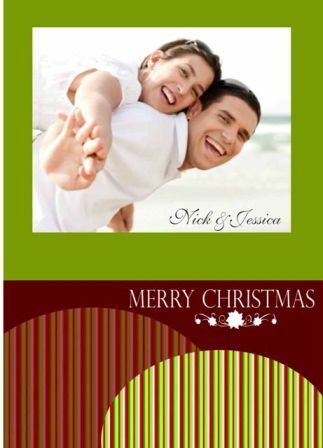 Thinking of You greeting cards are perfect to show your friend or loved one that someone cares. You can use different sentiments such as "Thinking of You", "How are you?" 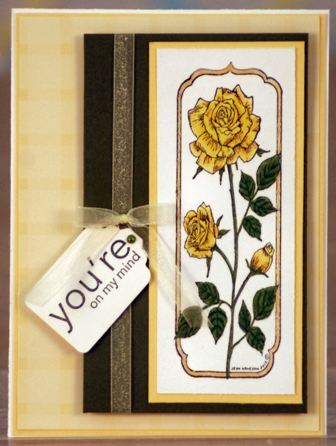 or, the sentiment I used for this card, "You are on my mind". Cut white card stock at 2”x 5”. 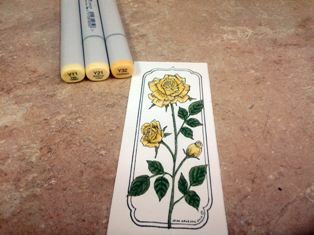 Stamp rose image using Tuxedo Black ink. Color image with Copic and Memento Markers. 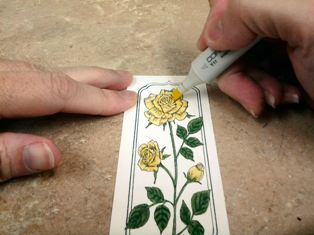 Apply Crystal Lacquer to the frame around the rose image. Allow it to dry completely. 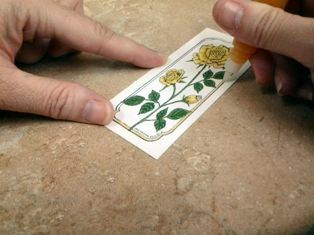 Cut yellow card stock at 2¼”x 5¼”. 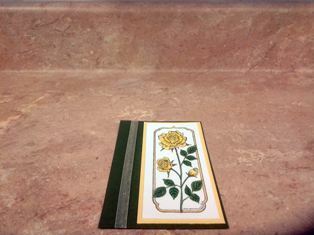 Attach stamped image to the yellow mat. 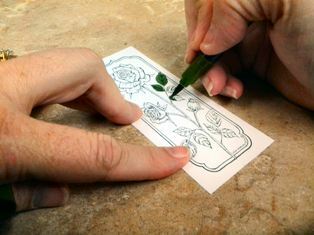 Cut green card stock at 2½”x 3¼”. 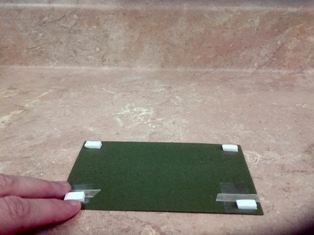 Attach the matted stamped image to the right side of the green card stock. Add yellow ribbon to the left side of the green card stock. 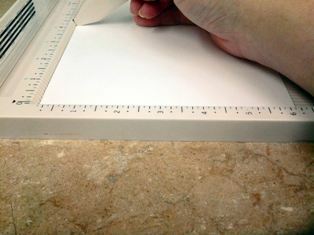 Cut yellow card stock at 6⅛”x 4½”. 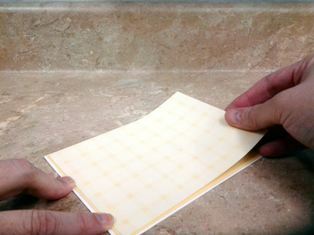 Cut yellow plaid card stock at 6”x 4⅜”. Attach to the card front. 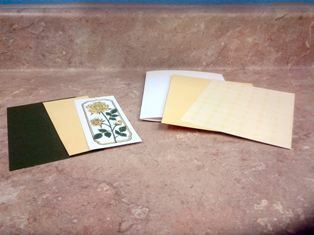 Attach the matted stamped image using Pop Dots to the card front. Add a small bow to the ribbon. 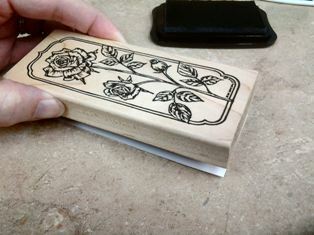 Stamp sentiment on a piece of white card stock using Tuxedo Black Ink. Cut out sentiment using the tag punch. 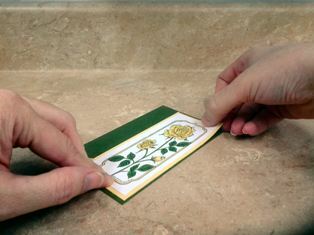 Attach the card front near bow using a Zot. And you're done! Here's our finished card!